Lansing is close to getting a new cellular tower on Conlon Road. 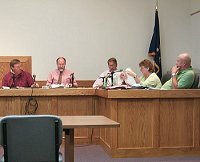 At the June 15 Town Board meeting it was reported that the town has received all the information needed from Cingular and that the "seeker" was complete. The town put off a final vote on whether to allow construction of the 195 foot tower until the County has time to respond. The County had been given the information that morning, so on the recommendation of both Town Attorney Guy Krogh and Cingular's attorney Douglas Dimitroff, the final vote has been postponed until the July 20 meeting.